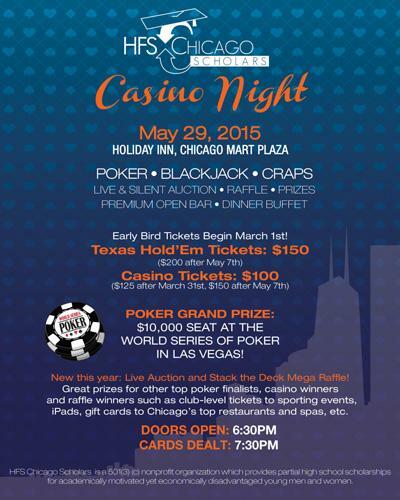 Join HFS Chicago Scholars Friday, May 29 at 6:30pm for their 4th annual Poker and Casino Night which includes a chance to win a seat to the 2015 World Series of Poker (valued at $10,000) in Las Vegas! The event is being held at the Holiday Inn, Chicago Mart Plaza. Your $150 ticket ($150 thru May 7 only, then $200) includes food, drinks and entry into the Texas Hold 'em Poker Tournament with $5000 of poker chips to start. Poker chips have no cash value. Chicago Poker Club is giving away seats. Share this article on Facebook or Twitter with hashtag#CPCScholars to enter! Attire: Cocktail, Business Casual or Dressy Casual is appropriate. Click here to learn more and register! college visits, selection and admissions support.